Sheraton’s Vistana Resort, Kissimmee, Florida, is consistently rated as a top timeshare rental resort on many lists and it's no wonder with it's 135 acres filled with fountains, lakes, tennis courts (13), swimming pools (7), hot tubs (8), and recreation centers (3). Not to mention the 18-hole miniature golf course, basketball and volleyball courts, children's playgrounds (2), and a host of family-oriented activities. The Manhattan Club, New York City, is a premier timeshare location in the middle of Manhattan, just 2 blocks from Central Park. Its budget timeshare rentals, although combined with elegant interiors and a suburb staff with a continental flare, allow for an affordable big city family vacation. Harborside Resort at Atlantis Paradise Island in the Bahamas is one of the world’s most famous resort destinations where celebrities rub elbows with vacationing families. The resort’s natural beauty of warm ocean breezes, blue crystal waters and amazing white-sand beaches, combined with activities that include family-friendly waterparks and adult casinos, make this a popular budget timeshare rental vacation destination. Royal Sands, Cancun, Mexico is truly a resort where your timeshare rental vacation experience will make you feel like royalty. This premier resort has been one of the top-rated resorts in the world since 1975, and with its spectacular Caribbean beaches and incomparable amenities this will be a vacation experience you'll never forget. Westin Ka’anapali Ocean Resort Villas, Maui, Hawaii, is located in historic Lahaina on Maui's North Beach, a beach which has been rated on "America's Best Beaches" list. This resort sits on 26 acres of lush tropical landscaping with spectacular views of the Pacific Ocean and of the islands of Lana'I and Moloka'i. A budget timeshare rental here will have you relaxing in no time. Marriott’s Cypress Harbour Resort, Orlando, Florida, has timeshares for rent that start as low as $100/night. This incomparable resort offers lighted tennis courts, and a 15-acre picturesque lake complete with a beach area and watersports. The serene setting and ultimate in pampering will give you a wonderful feeling of extravagance, even though the timeshare rentals are budget-friendly. These are all luxury resorts where yes, you can afford to take your family, simply by taking advantage of the many budget timeshares for rent. "How to Rest on Your Vacation." That seems a no-brainer. Except that in this day and age half of you find it hard to "turn off," and instead turn your vacation into a mini work week. The other half of you come back from vacation bushed and exhausted from trying to cram too much into your few precious vacation days. Dr. Matthew Edlund, author of "The Power of Rest," offers these 6 great tips on how to turn your timeshare vacation into the rejuvenating, relaxing, and pleasurable experience it was meant to be. Get enough sleep. Most Americans are sleep deprived, so your vacation is a good time to work off some of your "sleep debt." Spend time enjoying food. Food, Dr. Edlund points out, is more than fuel - it's also love, pleasure and celebration. On your vacation try dining rather than feeding by enjoying food socially. And a timeshare advantage: Being able to cook in your timeshare kitchen will eliminate the hectic rushing to get out and get fed. Get outside. Dr. Edlund states that studies prove that moving in nature, especially when surrounded by greenery and water, markedly and quickly improves mood. Even if you are in the most urban of environments, get to a park or waterside if you can. "Nature is high, wide, vast, and deep, and moments spent in nature can make us feel better physically, mentally, and spiritually," declares Dr. Edlund. Emphasize experiences. "You don't want to treat a vacation like it's a job, where you manage to run through 17 palaces, 24 museums and 11 amusement parks in 8 days," says Dr. Edlund. "Take time to look and see the unexpected. Let serendipity take its eventful course. The great fun of travel is to experience the new." Figure out your desired level of adventure and go for it, but don't forget that rest is a critical part of a healthy lifestyle, so be sure to schedule down time. "Rest renews, rebuilds, and rewires our brains and bodies," points out Dr. Edlund, "which can make us look better, feel younger, and be healthier." "And please," pleads Dr. Edlund, "turn off the cell phones, forget the emails, hide your blackberry, and only use your iPad for directions on how to find the closest park." Disney's Main Street Electrical Parade is Back! For a limited time this famous parade will wind itself down Main Street at Walt Disney Resort's Magic Kingdom in Orlando, Florida, in celebration of the "Summer Nightastic!" entertainment package. Run, don't walk, to your nearest Orlando timeshare rental this summer to take advantage of this great opportunity to once again see this exciting parade. 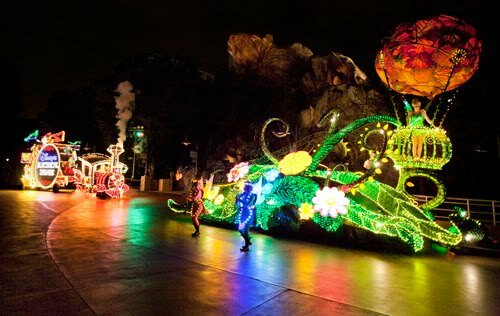 The Main Street Electrical Parade was a mainstay at Disneyland in Anaheim from 1972 until 1996. It featured floats and live performers covered in thousands of electronically-controlled lights. A synchronized soundtrack was triggered by radio control along key areas of the parade route. During the summer of 2010 the original parade can be seen at the Magic Kingdom, and an updated version, that includes LED pixie dust, will perform at Tokyo Disneyland. Wikipedia does a good job explaining just how this amazing parade works. The engineers who helped create the parade in 1972 also created the first show-control program in existence. This allowed the 2,000-foot long parade route to contain multiple radio-activated "trigger zones." Using radio-activated triggers as each float entered a zone, the audience would hear float-specific music through the Disneyland audio system. Each zone was between 70 and 100 feet long, and the zoned system meant that every person watching the parade would experience the same show, no matter where they stood along the parade route. Until 1977, some of the floats like the elephant train and the American flag finale were 2D and had to be pulled or pushed along the parade route. The Blue Fairy float was a 3D float, and ran until closing. The Big Bass Drum pulled by the Casey Jr. Engine, the Cinderella float and a Chinese dragon (later replaced by Pete's Dragon) and the circus calliope were all 3D. Most of these original floats can be seen in the 2010 parade at the Magic Kingdom. As important to this parade as the lighted floats is the music. The unmistakable jaunty theme is based on a song entitled "Baroque Hoedown." The original version was created in 1967 by early synthesizer pioneers Jean-Jacques Perrey and Gershon Kingsley. Many of you parents and grandparents remember the Electrical Parade as a wonderful part of your childhood, and now you have a chance to make sure the next generations get to experience the same incomparable Disney magic. When the kids see the parade for the first time, once will Not be enough! A timeshare rental, and multiple-day passes to the Magic Kingdom, will allow everyone in the family to see this special Disney attraction again and again! Urban Kayaking makes a great timeshare vacation idea, and if you plan it right, you can combine this fun sport with celebrating the Fourth of July. Most of the cities mentioned below have July 4th fireworks over their bays and harbors - giving the kayaker the perfect view from out on the water. Many waterfront cities in the U.S. have kayak outfitters that offer equipment rentals, and either guided or Do It Yourself tours. Following is a list of some of the top urban kayaking cities in America, where you can rent a timeshare and spend the week seeing the sights as you never have before! Rent a San Francisco timeshare and head to City Kayak (see photo above provided citykayak.com), which offers rentals and a guided 3.5 mile Alcatraz tour. You can even head out under the Golden Gate Bridge to the open ocean - if you're up to it, and are an advanced kayaker. On the 4th of July this city will be giving two firework displays over the bay - double the fun for your money! Rent a Washington D.C.area timeshare and get in touch with Jack's Boathouse where you can get an affordable kayak rental and directions for paddling on the Potomac. You can go upstream into the "wilds of Virginia," or, on the 4th of July, choose to ride the current down to the Washington Monument to watch the spectacular "Capitol Fourth" fireworks. A Boston timeshare rental will allow you to kayak around this historic city even in the cold New England winter. Hook up with Charles River Canoe & Kayak for equipment rentals and touring instructions. On the 4th of July watch Boston's magnificent fireworks reflected in the water as they're synchronized with the Boston Pops orchestra. Rent a NYC timeshare and explore this metropolis via kayak from the Hudson River. The New York Kayak Company has all of the equipment rentals you'll need. And on the 4th of July you'll have a front-row seat for the Macy's Fireworks Spectacular released from six barges in the Hudson River. In the second of our two-part series on safety tips for traveling with children, we will pass along suggestions by the Emergency Nurses Association (ENA) on how to be prepared for an actual visit to the Emergency Room. Hopefully your summer timeshare family vacation will be enjoyable and go off without a hitch, but knowing what to expect if you do take a detour to the hospital will help you meet the situation calmly and with confidence. If possible, research the Emergency Departments or walk-in clinics in the area you’ll be visiting before you go. You can get the names of the facilities from your timeshare resort concierge, and most facilities have online web sites. Those located in seasonal vacation destinations may only be open part of the year. Find out where they’re located and what their capabilities are. Some Emergency Rooms may also list estimated wait times on their web sites. “We tend to trust parents as far as their child’s vaccination history goes,” says Deena Brecher, E.R. Clinical Nurse Specialist at Alfred I. duPont Hospital for Children in Wilmington, Delaware. “But if they have any medical problems, especially complicated things, it’s always good to take a copy of their medical records with you.” If your child (or senior) has seen more than one doctor or specialist, be sure to have phone numbers for all of them. You should know about any allergies of the people you are traveling with, and be sure to bring along a list of medications and the dosages of each medication they take. If your child is with a relative or another adult, make sure they know how to reach you. Emergency Departments need consent from a parent or guardian to treat a child, so you should be accessible by phone or have gone through the proper steps to give someone else the power to make medical decisions. If your child is especially young, try to remember to grab a favorite teddy bear or doll. Having this "friend" to hug can go a long way toward calming the child, which goes a long way toward allowing the medical personnel to give optimal care in as short a time as possible. All of these tips are also good to know for any seniors with whom you may also be traveling, especially if they have given Durable Power of Attorney or Medical Power of Attorney to someone else. This is the first in our two-part series on safety tips from the Emergency Nurses Association (ENA) on traveling with children. Summer is a time when many families head out on a timeshare vacation that has been dreamed about and planned on for a long time. Vacations are for relaxing - but you don't want to be too lax and end up with a trip to the E.R. with one of the kids. “In a new environment, or when you’re doing new and different activities, there are risks you may not have thought of because you don’t encounter them every day," said ENA President Diane Gurney. The ENA offers these tips to help ensure a safe and happy family vacation. If you're driving, make sure everyone stays buckled in, and car seats are used. Pack the car so heavy and dangerous items will not fly about the car if you are in an accident. DO NOT text and drive, and only use hands-free devices for talking on the cell phone. Take frequent breaks to keep alert - it's just as easy to doze off during the day as at night. If you're flying, remember to take the car seat which you'll need in the taxi. If you'll be renting a car at your destination, check to see if a car seat can be included. At your timeshare, child-proof it just as you would at home. Bring electric outlet covers with you. Look for trip hazards, and put out of reach anything little ones could accidentally ingest. Use rubber bands or twine to keep cupboards and drawers in the kitchen closed if they contain knives, glassware, cleansers, etc. At crowded places such as theme parks, pin a piece of paper with contact information on your child (in a pocket or by a hem, etc.) in case they get lost. Also take a picture of your child with your cell phone camera so you'll have a picture of what the child is wearing. Swimming - make sure there is a lifeguard at the pool. If the pool is posted to have no lifeguard on duty, remain with the child at all times. If the child is old enough to swim without a parent, make sure they use the "buddy system." Outdoor activities require sun screen, which must be reapplied at least every two hours. And make very sure that the children stay well hydrated. Ideally outdoor activities would be done during the cooler times of the day, typically before 10am and after 4pm. With these safety tips, and using your parental common sense, you and the kids are bound to have fun on this year's summer timeshare vacation. "We're here, now what?" Good question. You've planned a great destination for your family's vacation, selected the perfect budget timeshare rental in a terrific resort, and now want to get out and explore your surroundings. Here are some tips on how to get the most out of enjoying the discovery of a new place. The first step is to supply yourself with maps and tour books. If you are a member of AAA you already know that both of these are available through your membership. At your vacation destination, a visit to the closest visitor's center will yield not only these items, but most likely coupons for local attractions and eating establishments. Your resort's concierge is another great resource for printed tour material as well as suggestions on activities and places to visit. There are a couple of different ways to see the places of interest in your area - a self-guided tour and an escorted tour. A self-guided tour is self-explanatory - you navigate the route yourself. It's easy to do self-guided tours by obtaining walking tour and driving tour booklets and pamphlets. For example, when you rent a Branson timeshare in the spring or fall the visitor's center will provide you with a self-guided driving tour booklet that lets find the perfect look-out spots for enjoying the Ozarks in their blossoming spring finery, and in their glorious autumn colors. Another great place for a self-guided tour is the Freedom Trail in Boston. Rent a Boston timeshare and here you have the option of following the printed Freedom Trail walking guide material, or renting headsets for self-guided audio tours. Take a timeshare vacation on Cape Cod and plan a self-guided tour of the many lighthouses and State Park beaches. A southern California timeshare vacation will put you in the right place for either a self-guided walking tour, or driving tour, of many famous Hollywood attractions. Many places offer escorted tours where a tour guide directs the route and times, and gives informative narration. Most large cities offer a sight-seeing tour by Greyline Tours, including New Orleans and Nashville. Several cities, such as New York City and San Francisco, have the popular "Hop On Hop Off" tours which are a combination of self-guided and escorted. Also, many smaller resort towns offer trolleys which not only give you a tour of the area, usually accompanied by a guided narration, but also provide easy public transportation. Taking a family timeshare vacation to someplace new offers a fun opportunity to learn about history and culture, and to experience the sights, sounds and flavor of a place that can be wonderfully different from "home." School is out, summer is here, and that just means one thing - it's time for the family vacation. Once you've decided on your budget, and then on your destination (Beach? Mountains? Theme parks? Visiting Grandma and Grandpa? ), select a timeshare rental and you'll be all set! If you'll be traveling with school-age kids, your summer vacation can be an exciting time to share experiences with them. Kids this age are eager to spend family time, willing to participate in the planning, and their inquisitive nature can make the trip fun for mom and dad. Let the kids start marking off the calendar at least a couple of weeks before the trip. Waiting can be very exciting. Use the calendar as a means of keeping everybody on track by making a "count down" of when particular tasks need to be completed. Also at least a couple of weeks ahead of time make a list with each child of what to pack. You may have to make some appropriate decisions on the type of clothing, but let the children choose what favorite items they'll take. A week before departure day is a good time (put it on the calendar!) to check over the clothing to make sure it's all in good repair. The kids can be responsible for carrying their own backpacks, which will also lighten the load for you. Let the children decide what to take on the plane, or in the car, to pass the time. In your own carry-on bag pack snacks, gum and wet wipes. Your bag can also include a surprise toy (a good one is a disposable camera) for each child in case of unexpected wait times at airports. The night before departure discuss safety and security rule, like where to meet if you get separated. This is also a good time to let them know what to expect when going through airport security (they'll have to let go of their backpack, doll, teddy bear for a few minutes.) Also remind your older youngsters that "My dad has a bomb" jokes are not funny. When you've chosen your timeshare rental, you'll get information about the many amenities at the resort. Make an itinerary of each day's plans, including resort activities, along with a few "Plan Bs" so your youngsters aren't disappointed if plans change. And be sure to include some "down time," which is easy to do since your timeshare will be spacious, with plenty of room for the entire family to relax. "Rediscovering Balboa Park While Searching for the Prado Restaurant" is a delightful little article at GreatFoodFunPlaces.com. And Balboa Park in San Diego, California, is definitely worth discovering. A San Diego timeshare vacation gives you the opportunity for a great beach vacation, to visit a world-famous zoo, enjoy Sea World, and explore Balboa Park. Balboa Park is a family-friendly destination, full of all sorts of places perfect for every member of your tribe. The largest urban cultural park in the U.S., Balboa Park is home to 15 major museums, renowned performing arts venues, beautiful gardens, hiking and biking paths, and the San Diego Zoo. It covers over 1200 acres and was placed in reserve way back in 1835, making it one of the oldest sites in the United States dedicated solely to public recreational use. Admission to the beautiful grounds of the park is free, allowing you to walk across a wooden footbridge and down some stairs to the hidden oasis of Palm Canyon. More than 450 palm trees, many of them dating back to 1912, offer a still, quiet getaway. Or meander through the sweet-smelling Inez Grant Parker Memorial Rose Garden, an award-wining All-America Rose Selection Display Garden containing over 2,400 rose bushes in 180 varieties. The Japanese Garden (which does have a nominal entrance fee) offers lovely secluded areas, a zen garden and koi pond for peaceful contemplation. The world-class museums in Balboa Park include the San Diego Art Museum, the Timkin Gallery, home of the Putnum Art Collection, and the San Diego Air and Space Museum which exhibits mint condition restored aircraft, just to name a few. Admission to the Balboa Park museums is always free on every Tuesday. Another weekly free activity is the organ concert at the Spreckels Organ - given every Sunday afternoon from mid-June through August. This 1914 pipe organ is one of the world's largest outdoor pipe organs, and has been giving the citizens and visitors of San Diego free concerts since 1917. Balboa Park's Starlight Theater, presented by the San Diego Civic Light Opera Association, is one of the oldest continuously producing musical theatre companies in the United States, and offers delightful revivals of Broadway musicals on an outdoor stage mid-June into September. Built in the style of Shakespeare's Globe Theater in London, Balboa Park's Old Globe Theater is celebrating its Diamond Jubilee in 2010. The Old Globe Theater is the first theater in the country to win the prestigious Tony Award for Best Regional Theater, and offers theatrical productions year-round. Your timeshare vacation in San Diego will give you plenty of time to explore and relax in beautiful Balboa Park. And remember to hunt for the Prado Restaurant! Washington, D.C., is a timeshare vacation destination beloved by American families, and many other families who travel across the globe to experience the U.S. capital city. Numerous museums and monuments parade America's history for all to see, learn about, enjoy, and even revere. That is, unless you're a kid. Museums and monuments can get kind of boring, you know? Never fear - Parents Magazine has compiled a great list of really cool things to do in Washington, D.C., that will leave your kids with happy memories of this great city. How about a ride around the monuments at twilight, in a either a horse-drawn Cinderella carriage or a horse-drawn Surrey with the Fringe on Top? That would be fun enough, but add private guides - Beanie, Boomer and Bambi. These friendly Jack Russell terriers will love to sit on a lap for the ride! Or how does a Pajama Party sound? With none other than Honest Abe! PJs are the dress of the evening when the kids attend "Goodnight Mr. Lincoln." Held at the Lincoln Memorial, this evening walking tour is designed for kids 4 to 10, and their parents of course, with lots of fun stories and games. If standing in line at the Washington Monument is too much for the little ones, head to the 1890-era Old Post Office Tower. Here they can get a great view of the Washington Monument and the surrounding vistas from the 270-foot-high observation deck. A favorite stop is sure to be the National Zoo - and admission is Free! Right now on exhibit in the Elephant House are 2-year-old Kandula and his 9,200-pound mom, Shanthi; 2-year-old Kojo and his mama Mandara play together in the Great Ape House. And you never know when the Orangutan family will swing by overhead on the outdoor O Line! As you head down Pennsylvania Avenue toward the U.S. Capitol Building, stop off at the Capital Children's Museum. Here your youngsters can slide down a fire pole, scramble through manholes, and climb behind the wheel of a Metrobus. Older kids can star in cartoons in the Animation Lab or perform experiments in the Chemical Science Center. One museum sure to score big is the National Air and Space Museum where your kids can pilot their own aircraft in flight simulators, and test paper airplane designs. Take another Metro ride to historic Georgetown, and enjoy a mule-drawn boat trip through the C&O Canal. The kids can even feed the mules if you BYOC - bring your own carrots! It's Up, Up and Away for the airline industry. Previously mired in the sunken economy of one of the world's worst financial crises, the airlines appear to be rebounding at a faster rate than had been predicted. That's great news for all of you timeshare vacationers! The International Air Transport Association (IATA) has just released a report in which it expects airlines around the world to post a $2.5 billion profit in 2010, compared with its previous forecast in March for a loss of $2.8 billion. Passenger traffic is now expected to grow 7.1% this year compared with its previous forecasts for 5.6%. More good news for those of you who will be flying to your timeshare vacation is that new capacity will be added to the global airline system as a result of the 1,340 new aircraft that are scheduled to join the global fleet in 2010. Of these, just 500 are replacement aircraft, while the rest will increase seating capacity. Across the globe, airline industry highlights include the Asian economy (excluding Japan), which is expected to grow by 7% this year. China will outpace that with an expected 9.9% GDP expansion. As a result, the region’s carriers are expected to deliver the largest profit at $2.2 billion. This is more than double the previously forecast $900 million in March and a major reversal from the $2.7 billion loss in 2009. North American air carriers are expected to return a profit of $1.9 billion. This is a major reversal from the previously forecast $1.8 billion loss, and the $2.7 billion that the region’s carriers lost in 2009. Middle Eastern carriers are expected to post a profit of $100 million - their first since 2005. This is significantly better than the $600 million that the region’s carriers lost in 2009. And African carriers are expected to post a $100 million profit, their first since 2002. This reverses the $100 million loss previously forecast in March and the $100 million that the region lost in 2009. '"Seeing black on the bottom line is a great achievement," commented Giovanni Bisignani, IATA’s director general and CEO. "The resilience of the industry has been strengthened by a decade of cost cutting, restructuring and re-engineering processes, with efficiencies in safety auditing, fuel management, infrastructure costs, and simplifying the business." European airlines will continue to struggle, however. A stagnating economy, strikes, natural disasters, and a currency crisis are expected to result in an anticipated loss of $2.8 billion. The IATA report states that 70 % of the loss in revenue is a result of the volcanic ash crisis borne by the European carriers. We post a lot of articles about family vacations, but how about a romantic getaway? A top timeshare romantic vacation destination is, of course, beautiful Hawaii. The tropical South Seas have always had the allure of romance. Hawaii's islands offer romance around every corner - and curve of the beach. Oahu has Waikiki Beach, famous the world over and it can be crowded. But here you can also take tandem surfing lessons - literally fall into each others arms and into the turquoise waters of the South Pacific. A drive up the west side of the island will reward you with numerous small beaches that are very often almost deserted. Wander a soft sand beach amidst coconuts that have fallen during the night. Take one back to your timeshare kitchen and put in two straws to share its sweet juice from its own coconut shell. See Oahu timeshares. On Maui a must-do on your romantic getaway is to watch a startling brilliant sunrise from high atop Haleakala. The dormant volcano is 10,000 feet and the top is chilly, so you'll have to snuggle together! Maui also offers great hiking - another activity that you can enjoy together. Above the Pools of O'heo is the Pipiwai Trail, considered one of the best hikes on Maui. There are several sparkling waterfalls along the route, with the final destination being the Waimoku Falls that spectacularly plunges 400-feet down a sheer lava rock wall. 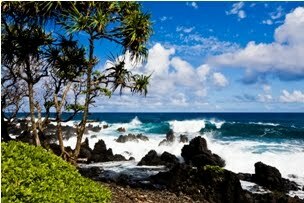 See Maui timeshares. Kauai is known for its wide, uncrowded beaches with stunning sunset views. Or you can hike the mist-shrouded Alakai Wilderness Trail where you'll actually walk through clouds. Rent kayaks and tour along the base of the sheer cliffs of the spectacular Napali Coast. Kauai has an amazing array of festivals, and whether you're interested in Hawaii's special island music, in Polynesian culture, or in the paintings and sculptures of Hawaii's talented artists, you can "festival hop" during the busy summer festival season. See Kauai timeshares. On the Big Island take a horseback ride across the expanse of Parker Ranch, a real working cattle ranch. Your Paniolo (cowboy) will guide you from splashing along the surf to entering mango groves where you can pick the sweet fruit right off the tree and enjoy a refreshing treat along the trail. And there is no better place for a romantic picnic than Rainbow Falls, a stunning waterfall in Hilo. Cascading for 80 feet, and 100 feet in diameter, the huge volume of water plunges over a lava cave, and creates mists where rainbows dance in the sun. See Hawaii timeshares. Nothing says "I love you" like a romantic timeshare rental getaway on the islands of Hawaii! There is a lot of history on Oahu. This Hawaiian island is more than a south Pacific beach destination. Certainly you can get the sand and the surf, the beautiful turquoise waters of the tropics, palm trees swaying in soft trade winds - the entire package. But, when you rent an Oahu timeshare, you also get the unique opportunity to explore history that literally changed the world. When the Japanese Imperial Navy attacked the U.S. Pacific fleet in Oahu's Pearl Harbor, the United States was forced to enter WWII. The United States then participated in not only the war's Pacific theater but in Europe as well, and the result created a different world order. To get a good feel for what that horrific day in December, 1941, was like when Japanese Zeros bombed American ships, visit the U.S.S. Arizona Memorial, set out in Pearl Harbor. The U.S.S. Arizona Memorial marks the resting place of 1,102 of the 1,177 sailors killed on that battleship during the attack. The Memorial, dedicated in 1962 and visited since by more than one million people annually, is built directly above the sunken hull of the battleship. In a section of the Memorial known as the Shrine, an opening in the floor overlooks the sunken decks. If you choose, you may toss flowers into the water here in honor of the fallen sailors. Tossing leis is not allowed as the string poses a hazard to sea-life, but leis may be placed on the guardrails located in front of the marble wall that bears the names of those killed. Historical information about the attack, boat access to the memorial, and general visitor services at the Visitor Center have been provided by the Arizona Memorial Museum Association (AMMA) since it was founded in 1979 as a non-profit cooperating association with the National Park Service. The AMMA officially changed its name to Pacific Historic Parks (PHP) in 2010 to reflect its expanded role. 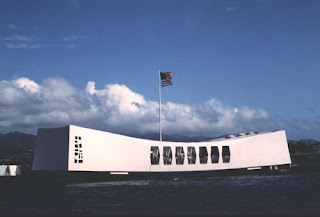 On Oahu, the PHP operates the World War II Valor of the Pacific National Monument which covers not only the U.S.S. Arizona, but other WWII sites including the U.S.S. Missouri, the battleship on which the Japanese signed surrender papers ending WWII. On shore the PHP's new $58 million Pearl Harbor visitor center complex, scheduled for completion in December, 2010, will feature more than 6 acres of landscaped grounds and wayside exhibits. The new 24,000 square foot Visitors Center building includes a museum and an education and resource center. A Hawaii timeshare rental vacation on Oahu will give the entire family a chance to re-live history, and understand how the world as we now know it came to be. Everyone wants to stay healthy on vacation, and Dr. Oz has some airplane travel health tips to help the process. Who hasn't heard of Dr. Oz? With a name like that you certainly can't forget him! Mehmet Cengiz Oz was actually born in Cleveland, Ohio, but of parents who had immigrated from Bozkur, Turkey. He's a cardiac surgeon performing over 200 open heart surgeries each year, and he is a complementary health expert. He has made frequent appearances on Larry King Live, CNN, and other networks. 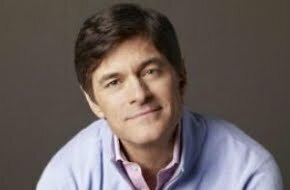 After guest staring on The Oprah Winfrey Show for five years Oprah's company, Harpo Productions, together with Sony Pictures, launched the "The Doctor Oz Show" on syndicated television in 2009. Dr. Oz travels the world over, and offers some travel health advice that we'll pass on to you here. If you'll be flying to your summer timeshare vacation, these are some tips that will go a long way to help you arrive at your destination in fine shape and ready for the fun ahead. First of all, before you even travel, Dr. Oz says to "plan some prior protein." The last meal before traveling should contain a good balance of protein and starch (concentrate on the protein, he says), so you will feel satisfied. At the airport and on the plane be sure to avoid salt and calorie-laden snacks. Extra salt will make your legs swell even more than they're already going to as you sit for long stretches of time with little exercise or movement. You'll want to do what you can to avoid leg swelling, and the possibility of blood clots in your legs, which, Dr. Oz says, even healthy people can get on a long flight. Try to walk up and down the length of the plane every now and then to increase circulation in your legs. And remember to stretch your calf muscles even while you're sitting. Airplane air is very dry, so you'll want to keep well hydrated during the flight. Drink lots of water, unsweetened juices that might be offered such as apple juice and orange juice, and other non-caffeinated beverages. Drink alcoholic beverages very sparingly, if at all, as alcoholic drinks can be dehydrating. Nobody likes to talk about it, but everyone who has traveled knows that constipation can be a real problem. It's a natural response by the body, says Dr. Oz, to unfamiliar environments, unfamiliar foods, and especially to an unfamiliar routine. 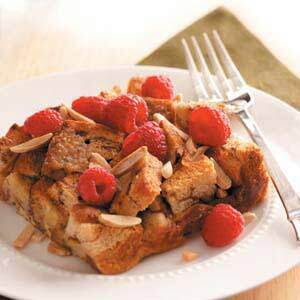 Dr. Oz suggests being vigilant about taking in plenty of fiber and water. One reason why taking fresh fruit onboard the plane for snacks is a good idea. Follow Dr. Oz's healthy travel tips, and have a wonderful vacation wherever your timeshare travels take you! South Africa begins hosting the World Cup this month, shining the spotlight of world travel on not only that nation but all of Africa as well. In a previous post we talked about how international tourism is rebounding, especially in the Asia and Africa markets, and in another post we highlighted the month-long World Cup competition. A timeshare exchange can get you on board with the world's newest travel hotspot - Africa. If you're wondering where in this huge continent to go, keep an eye out for the results of the "Travel Oscars," which will take place during the World Cup. Twelve hundred of Africa’s key "movers and shakers" will attend the most important event of the year for Africa's travel and tourism industry, on July 7, 2010, in Johannesburg, South Africa. The gathering for the World Travel Awards “Africa and Indian Ocean Ceremony 2010” will include CEOs and directors of some of the region’s leading travel companies, government ministers, heads of tourism departments and destinations, as well as industry association leaders. “This is Africa’s finest night for tourism,” explains Graham E. Cooke, Founder and President, World Travel Awards. “It’s a once-a-year opportunity to recognize the exceptional quality, creativity and leading edge performance of Africa’s top operators. And because consumers use the awards as a benchmark of quality, the winners receive significant commercial benefits from the honor." During the past few months, industry professionals around the world have been voting for the African companies and brands that they believe deserve to be recognized. The nominees are among 5,000 nominated African companies, spread across more than a 1,000 categories, including airlines, cruise companies, destinations, resorts and hotels. World Travel Awards, described as the ‘Oscars’ of travel and tourism, was established 17 years ago and is the only global organization that encourages and supports improvement and development of the travel and tourism industry. So pay attention to the winners, and give yourself the unique opportunity to explore this fascinating continent by taking advantage of your timeshare exchange program, one of the great bonuses of being a timeshare owner. Forbes has put out a list of America's Top 10 Tourist Sites. If you're wondering just where to rent a timeshare for your family's vacation this year, this Forbes list has some great suggestions for where to travel. Forbes, Inc., is a main source of information for the world's business leaders and is among the most trusted resources for business executives. This list was compiled by Forbes to assist business leaders in the tourist and travel industry, giving insight into. what lures a tourist to a specific place, observing that "A city's tourism industry is dependent on various factors including safety and crime rates." You, too, can use this very list - to make your own travel plans, knowing that many criteria went in to making the list which is all helpful to ensuring a great family vacation destination. Times Square, New York City - dazzling billboards, street performers, and even a grandstand where the family can sit and take it all in; also entertainment venues such as M&M World, and Madame Trousseau's Wax Museum. Las Vegas Strip - many free, family-oriented entertainment sites including the famous Bellagio Fountains and The Mirage's exciting Volcano eruption. National Mall and Memorial Parks, Washington, D.C. - Nine major museums of the Smithsonian including the American History Museum and the Air and Space Museum, bookended by the Capitol on one end and the Washington Monument on the other. Fanuel Hall Marketplace, Boston, MA - 250 year old historic marketplace offers shopping, dining and a cast of street performers so famous that there is an annual Street Performer Festival. Magic Kingdom, Walt Disney World, Orlando, FL - upcoming attractions include the new Fantasyland expansion, Ariel’s Adventure and Star Tours II 3-D.
Golden Gate National Recreation Area, San Francisco, CA - spreading 60 miles along the Bay's coastline, includes Alcatraz Island, historic military forts and installations, and stunning views of the Golden Gate Bridge. Disneyland Resort, Anaheim, CA - Disneyland offers perennial favorites such as Pirates of the Caribbean and the Haunted Mansion. California Adventure is undergoing a multimillion-dollar renovation that will include Ariel's Undersea Adventure, and attractions based on the popular "Cars" film. Fisherman's Wharf, San Francisco, CA - three cable car lines converge here for easy, and fun, transportation to this bustling bayside area with its seafood restaurants, lines of moored fishing boats, and sea lions sunning on the pier. Hollywood Walk of Fame, Los Angeles, CA - stretching 2.4 miles, this sidewalk contains 2400 stars, and runs past another famous attraction, Grauman's Chinese Theater. In 2010 the Walk's 50th anniversary will be commemorated by a street festival in July. Great Smoky Mountains National Park, Tennessee and North Carolina - the most visited of all of America's National Parks. You can find a budget timeshare for rent at each of these sites, allowing the extensive research by the Forbes team to guide you this year to a truly fun and memorable family vacation. See New York City timeshares. See Washington DC area timeshares. With "The Wizzarding World of Harry Potter" opening June, 2010, at Universal Orlando Resort, in Orlando, Florida, now is a good time to take a closer look at this theme park of Universal Studios. Now is also a good time to rent an Orlando timeshare so your family will have a vacation that is not only memorable, but easily affordable. Universal Orlando Resort actually consists of three different theme parks: Universal Studios Florida, Universal's Islands of Adventure, and Universal CityWalk. Universal Studios Florida is where visitors can "Ride the Movies." Many of the park's movie-themed attractions are developed with the actual creators of the films on which they are based. For example Steven Spielberg helped create "E.T. Adventure," and "Twister - Ride it Out." Often the films' stars reprise their film roles as Christopher Lloyd did for "Back to the Future, the Ride." Rip Torn and Will Smith can be seen in "Men in Black: Alien Attack," and the entire cast of Shrek participated in creating "Shrek - 4D." A brand new island is where you'll find "The Wizzarding World of Harry Potter." Both the production designer and the art designer of the film series have guided the creation of this Harry Potter themed adventure. J.K. Rowling, the author of the books, has also been involved, down to determining the taste of the Butter Beer served at The Three Broomsticks in Hogsmead. Universal CityWalk is an exciting night time entertainment venue and includes a 20 screen AMC Universal Cineplex, and numerous shops, restaurants and clubs. It is home to Margaritaville, NBA City Cafe, NASCAR Cafe, and Hard Rock Café. The clubs include Latin Quarter, Bob Marley's, and the Red Coconut. Universal Orlando Resort is a fun place that certainly has something for everybody, and a budget timeshare rental will give your family plenty of time to explore it all. Timeshare is a wonderful vacation alternative, regardless of some negative publicity over the years. Owning a timeshare offers families the opportunity to not only go back to a favorite vacation spot year after year, but also the flexibility to choose different destinations and times of the year through timeshare exchange, all the while staying in spacious accommodations at exciting resorts. Most timeshare offers ¬are legitimate, but unfortunately scams and shady deals have ensnared enough unsuspecting people that timeshares have developed a bad reputation. Here are some tips on how to: avoid timeshare scams, do your own research and be informed. Most timeshare scams are part of high-pressure, incentive-induced sales pitches that are most often encountered in a "timeshare presentation" by resort developers or timeshare companies. If you are offered a prize as an incentive, either through the mail or at a resort, read the fine print, and don't pay for anything. And don't ever call a 1-900 number to book a trip you've been offered, as that most likely is also a scam. If you do attend a presentation, sit on your hands, put duct tape across your mouth, or whatever you must do to ensure that you don't buy "on the spot." Sleep on it and take the time you need to make a proper evaluation on whether this is really a good deal or not. Chances are that your research will point you in the direction of legitimate timeshare resales that you can purchase for much less. If the sales presentation becomes too high-pressured, leave. You have the right to go, and with no arguments. One way of diffusing the situation fairly quickly is to ask for references of happy customers. If the presenter balks at giving you references, that's a good sign that it's time to get out of there. Here is what we suggest you do instead - find a legitimate company through which you can purchase a timeshare resale. The American Resort Development Association (ARDA) provides three timeshare resale advisories that will help you navigate through the secondary market, to ensure a safe and positive buying experience. RedWeek.com, the largest on-line marketplace for timeshare rentals and resales, holds the coveted A+ rating from the Better Business Bureau, and is an excellent resource for timeshare resale listings. The website offers an easy video instruction on How to Rent, Resell or Exchange Your Timeshare, along with a resource section that will answer many of your questions. With these tips, you are now well on your way to joining the over 4 million people who already are happily enjoying timeshare family vacations all around the globe.